The 32-inch Westinghouse LTV-32w1 ($900 street) LCD TV struck us with a sense of déjà vu, as it's cosmetically similar to the company's larger 37-inch LVM-37W1 television that we previously reviewed. The similarities carried over into our lab testing, as the LTV-32w1 has many of the strengths and weaknesses of its larger sibling. It delivers impressive high-definition image quality when fed a digital signal but falls short when receiving analog. The LTV-32w1's LCD panel is bordered by an attractive silver and dark-gray bezel with matte finish. A somewhat distracting, bright blue LED on the front of the TV can be disabled via the setup menu. The TV's bottom-mounted speaker is nonremovable, but its location gives the LTV-32w1 the illusion of being larger than 32-inch widescreen TVs with side-mounted speakers. Subjectively, we felt the sound quality of the LTV-32w1's stereo speakers lacked the warmth produced by the speakers on the Proview RX-326, but this may very well have been due to the differences in speaker positioning. We noticed no distortion or other anomalies at high volume, and even in a large room, the LTV-32w1 was almost painfully loud at maximum volume. The LTV-32w1 offers a native resolution of 1,366 by 768 pixels. The selection of A/V connections includes a DVI input that is HDCP-enabled for use with protected sources such as cable or satellite TV set-top boxes. Two component video inputs are supplied, as well as a VGA connection for use with PCs. We were impressed that 720p video signals as well as PC input (DVI or VGA) exhibited no overscan (extension of the edges of the picture beyond the active portion of the display), and 1080i signals showed only a slight overscan. The lack of an over-the-air HD tuner places the LTV-32w1 in the "HD ready" category, but an integrated NTSC tuner is provided for standard-definition analog reception. Most A/V connections are integrated into a block that protrudes 2 inches from the rear of the thin display. The face of the input block features VESA-compliant mounting holes with the inputs located along the left and right sides for easy access. However, this configuration doesn't allow a lot of finger room for making cable connections—especially on the VGA and DVI inputs closest to the back of the display. Spacing between individual inputs was adequate for the oversized interconnects common with premium A/V cables, though. An additional composite video input with stereo audio input jacks is located on the lower left side of the TV for easy access from the front of the display. While composite video output is available on most digital still cameras, it remains the "lowest order of life in video" and should be avoided if possible. The Vizio L32 has a similar set of side input jacks but includes a higher-quality S-Video connection as well for improved picture quality. Our subjective viewing examinations included the use of DVD videos and Windows Media Video HD movies, as well as standard and high-definition over-the-air TV. The LTV-32w1's display defaults using component video input produced a cool image (whites appearing slightly bluish), and shadows and other dark detail appeared too dark, obscuring detail. (Don't try to watch a night scene in The Matrix with the display default on; you'll see nothing but shadows.) Switching the LTV-32w1 to its warmest color temperature preset yielded a more natural-looking picture, but it wasn't until we switched to DVI input that we felt the dark detail was where it should be. When viewing HDTV and standard-definition content, the LTV-32w1 looked best when receiving digital video input. 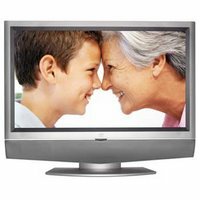 Inexpensive 32-inch LCD HDTV monitors like the LTV-32w1 use an older LCD technology that isn't as adept at maintaining good color saturation when viewed at an angle. At angles of 30 degrees or more, we noticed that the LTV-32w1's color saturation began to fade. Compared with the 32-inch Proview RX-326, the Westinghouse LTV-32w1 gave us about 10 degrees more of a viewing angle (from all sides) before the colors began to fade. In the lab, we continue to be impressed by the ability of Westinghouse LCD TVs to produce very bright imagery and very dark black levels. The LTV-32w1 managed a record-shattering 833:1 ANSI contrast ratio (checkerboard test pattern) using its maximum backlight setting and 834:1 ANSI contrast ratio at its minimum backlight settings. An adjustable backlight control—one of the most important features any LCD TV can offer—is an ideal tool for optimizing the light output of a TV for the lighting conditions of the viewing environment without significantly altering color quality or image detail. Ideally, day and night viewing presets would be built into every TV, but an adjustable backlight at least supplies a single setting that can be used to make the TV as bright as possible for daytime viewing and dark enough at night to ensure that blacks appear inky dark rather than a dingy gray. In addition, we have yet to see another manufacturer match the range and granularity of the backlight controls found on Westinghouse LCD TVs. Our image uniformity and color accuracy tests using the LTV-32w1's DVI input were above average, with consistent performance from black to peak white. By contrast, the similarly priced Vizio L32 produced imagery that appeared overly red in the darker portions of the picture, while proper color balance was achieved only at peak white (red, blue, and green at maximum luminance). Our Radiant Imaging colorimeter did detect a single stuck pixel centered near the top of the LCD, but we found it wasn't noticeable or in any way distracting at typical viewing distances. We use the HQV Benchmark DVD to gauge a television's video-processing capabilities. This DVD contains a challenging array of synthetic and real-world video tests designed to evaluate how well a television handles common video-related tasks such as deinterlacing, noise reduction, and detail preservation. The LTV-32w1 managed to produce better results than other LCD TVs in this category, including the Proview RX-326 and the Vizio L32. The LTV-32w1's DCDi (Directional Correlational DeInterlacing) video processor from Faroudja helped suppress jagged-line artifacts in the test's video clips, and 3:2 pulldown detection (for film-based video) worked well. Noise reduction appeared poor, and the LTV-32w1 provided no adjustable settings to gauge its effectiveness. The Westinghouse LTV-32w1 has the best contrast ratio we've measured to date, but we continue to be disappointed by Westinghouse's treatment of analog inputs. Driven digitally, the LTV-32w1 is one of the best-performing HD monitors in this category. Its component video inputs, however, make it more suitable for console gaming than for critical viewing of quality video.